The Yadnya Kasada Ceremony Mount Bromo celebrated once in every year. The time existance of Yadnya Kasada Ceremony at Mt Bromo have the most important means for tenggerese tribes. They celebrated a greatest Yadnya Kasada ceremony or Javanese volcano festival to cure various diseases, problems experienced and to appease the nature from all disasters by the communities through an ancient Hindu mantras have recited by Hindu physician. These temple ceremonies are prayers to ask for blessings from the Gods and often last long into the night. The Yadnya Kasada time at Bromo Volcano always go on between on July - August in every 14th day of the Kasada Month in the traditional Hindu of lunar calendar. The Yadnya ceremony ritual hold in full moon time. This Yadnya ritaul ceremony has major to honor Sang HyangWidhi, the Almighty God, Roro Anteng, as a daughter of King Majapahit and Joko Seger, as the son of Brahmana kingdom. This Yadnya ceremony ritual Mt Bromo is a god offerings to Sang Hyang Widhi Wasa and the ancestors, especially Roro Anteng and Joko Seger. This traditional ceremony ritual Yadnya Kasada held in Pura Luhur Poten located 300 meters before Mt Bromo volcano crater. The ritaul activity celebrated all nights until early morning. Tengger tribe’s Ydnya Kasada ceremony ritual aimed at raising the shaman or healer that exist in every village in the vicinity of Mt Bromo. In this festival Tengger tribe would throw offerings of vegetables, chickens, and even money to inside of the Crater. Derivation of The Yadnya Kasada tour to Mount Bromo observed by the Tenggerese tribes, descendant of princes Majapahit kingdom since the 13th century, living in the highlands of Cemara Lawang. Though the majority of Javanese have converted to Islam, this unique community still clings to their beliefs from the ancient days of Majapahit till today. Like the Hindu Balinese, the Tenggerese worship Ida Sang Hyang Widi Wasa, (the almighty God), along with the Trimurti gods, Siwa, Brahma and Visnu, with added elements of Animism and Mahayana Buddhism. Right on the eve of the 14th month Kasada Ceremony tour Mount Bromo, Tengger tribe would together carry offerings of livestock and agriculture to Pura Luhur Poten and wait until midnight time when the shaman ordained elders. Next, prepared offerings brought to the top of the crater of the mountain to be thrown into the crater as a symbol of the sacrifices made by our ancestors. For Tengger tribe, the offerings were thrown into the Mt Bromo Crater as a form of vows or gratitude for livestock and agriculture are abundant. In the crater appeared to have waited many beggars and perch population living in the interior. 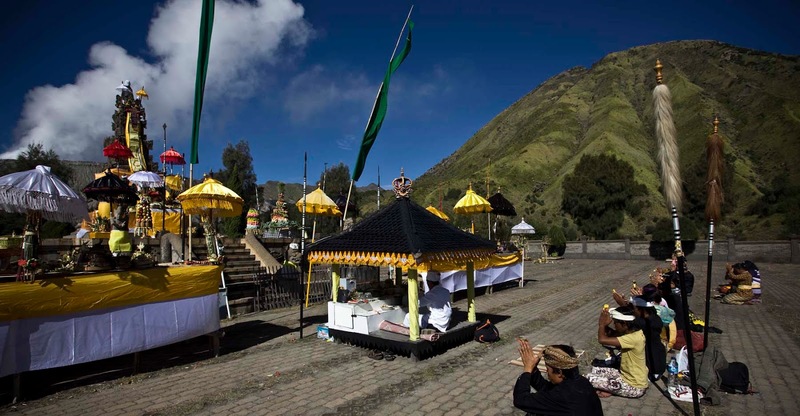 Interestingly they long ago had come here even deliberately set up temporary residence in the vicinity of Mt Bromo tengger national park and hope to get ongkek - ongkek containing offerings of fruits, livestock, also money. Activities perched inland residents who are in the crater of Mt Bromo you can see from the evening time until noon time the day before the Yadnya Kasada Ceremony celebrated. The best time to enjoy The Yadnya Kasada tour for Ritual Ceremony is 3 days and 2 nights. Most domestics and foreigners visitors enjoy their tour by witnessing the process of Yadnya Kasada Ceremony, especially for famous portrait photographers enjoy this ceremony tour activity at all nights, some of them make Mount Bromo Camping near the temple while enjoy Mount Bromo Milky Way tour photography because at night the temperature is very cold. After Yadnya Kasada ritual finish, You can also possible admiring Mount Bromo Sunset tour from the high peak because there are several peaks to see the Bromo views. The Yadnya Kasada Ceremony Time in Bromo is special time for Hinduism and only celebrated annually by tenggers commonity. If You need to see the Ceremony tour time, Hope You bring mountain clothes (Jacket, Gloves, Hat and other equipments) because the temperature in this Mountain reach 03 - 05 degree centigrade at night. For detail information about Mount Bromo Tour Package, Accommodation and other tour package facilities, You can visit Our Contact.